size 6: wd- 4.83" x ht- 7.34" size 7: wd- 4.91" x ht- 7.62" size 8: wd- 4.98" x ht- 7.69" size 10: wd- 5.06" x ht- 7.76"
size 12: wd- 5.46" x ht- 8.57"
size 12: wd- 11.39" x ht- 8.57"
Sweet collar for the neck that is slightly wider than noraml cut neck line. This is perfect for the Louise pattern by Children's Corner. Very easy to make and apply, comes with directions. Has feather stitching and bullion flower. 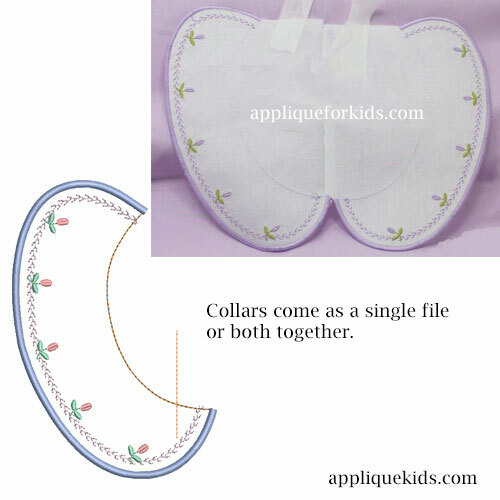 Since these are large size collars, please check that you have a hoop that will accomadate the collars.